Grail Link to the U. N.
Explorer Lauren Magrisso brought down the house at The Grail National Gathering closing brunch when she read this essay aloud. This weekend, I went on a retreat. It was actually The Grail National Gathering. What is The Grail you ask? In short, it is an international women’s movement committed to the integrated advocacy of social justice, environmental sustainability, creative energy and women’s empowerment. You see, the total is greater than the sum of its parts. Over the course of 70 years, they have built a web, a network, to support and inspire each other. Their mission provides a road map for them to make a true difference in the world, one that challenges you and enables you to become your best self. When we got together, we played, we danced, we sang, we created! These women know how to have FUN! Not the fun that comes from cheap thrills or harming your body, but the inoculating fun that warms the soul. What ties these women together is that they are all spiritual seekers. From many walks of life, when they found each other, they became a force to be reckoned with! At their worst, they are a group of strong, opinionated voices, and at their best, they are a group of strong, opinionated voices. You see, that is the point. Doing life’s work, working for your passion means you are willing to suffer because it is truly important. They are first to support each other in their times of suffering, and they are first to celebrate their successes. The Grail is like a second home; it is a true community. 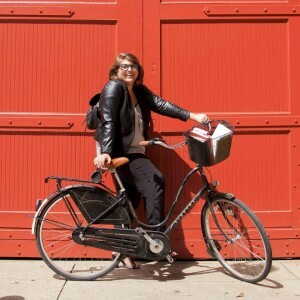 You see, friend, our kind of community, the kind that relies on pixels on a screen and an internet connection can leave us feeling lonely sometimes – especially when we are working to create social change. These women offer us a web to jump into, to continue building ourselves and the cause. At first, we will be supported by their web fully, standing on the shoulders of the work they have committed their lives to. But slowly, and surely, the web will become our own. It must, as we are the ones to carry the torch into the future. Today, the world is in need of this work more than ever. And what progressive groups like The Grail have realized is that you can’t chunk off disparate issues and see them in silos like the industrial revolution has trained our culture to do. No, we must look at the synergistic opportunity that comes from this integration. The beauty of this is that we don’t have to lose or suppress a piece of ourselves for the sake of “specialization.” No, we will fully live our journey in the loving arms of the collective journey. So come, join the collective. Gatherings usually include singing, centering, sharing of food and intellect. You can even travel the world with the promise of this community. The bonds with The Grail are limitless, and through all of it, you will realize that the bonds of your potential, too, are limitless. (Thank you for letting me observe your gathering and absorb the energy, intellect and love). 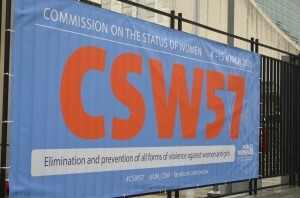 This past March, for two weeks participants from The Grail attended the 57th annual Commission on the Status of Women (CSW) at the United Nations. This year, the Grail brought more than 20 participants from various countries such as Brazil, Mozambique, Papua New Guinea, South Africa and USA. For two weeks we were participating in various events in different ways such as being part of some panels; contributing on the writing of the girls’ and young women’s statements; sharing experiences and giving testimony about their life and work; organizing our own parallel events; following the work of outcome documents; lobbying in some mission delegations and engaging with some communities. Together with other NGOs, the Grail co-sponsored some events. The Grail organized two parallel events as a result of the activities that we are doing in various countries. One parallel event was presented by girls between 16 and 18 years old. The title was: Challenges and Responses…Making Their Voices Heard. The girls from Brazil, El Salvador, Mozambique and USA, spoke and shared their struggles and stories that demonstrated that whatever the statistics, their daily experience causes devastating consequences. The event showed that violence against girls cuts across ethnic, racial, class, religious, educational and international borders. Another parallel event organized by The Grail was: Changing Systems that Hurt…the Role of Girls and Young Women. The presenters, girls and young women between 16 and 24 years old from Brazil, Mozambique, Papua New Guinea, South Africa and USA, are involved in their communities in advocacy and awareness campaigns regarding the empowerment of girls and young women to take responsibility for all matters affecting their lives. As always, attending this kind of event makes us take in both the breadth and depth of issues explored and in the commitment, passion, and talent of those present. 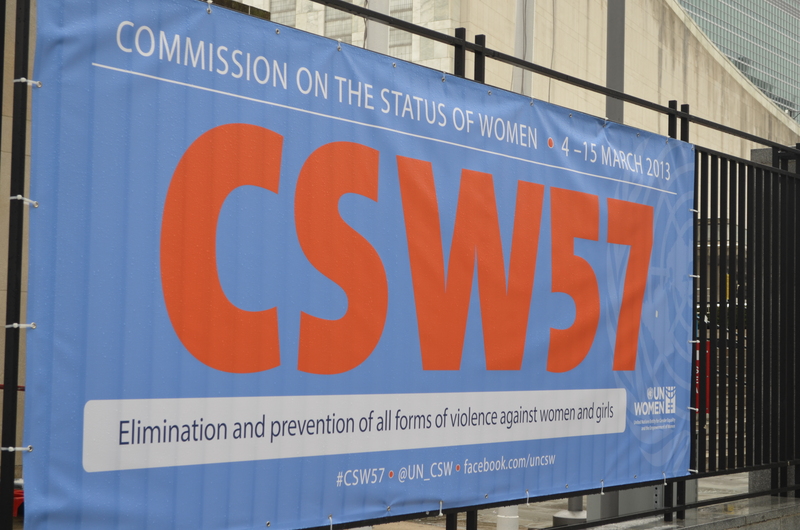 We consider CSW the lead champion of the global campaign for women’s and girl’s equality and empowerment; a place of reporting progress on women’s and girls’ advancement in their own countries and opportunity for NGOs sharing their challenges and lessons learned. Longmont, Colorado Anti-Fracking Group: People of the Year! Last month, Judith Blackburn told us about the successful anti-fracking electoral campaign the group “Our Health, Our Future, Our Longmont” waged this fall, to stop fracking inside their city. In late December, the group was named Boulder Weekly’s People of the Year. “It was strength in numbers that made it possible for the group…to overcome a $440,000 campaign launched by oil and gas companies in an effort to defeat the charter amendment banning hydraulic fracturing within city limits. More than any other single group or individual, ‘Our Longmont’ had a transformative effect on the discussion of perhaps the most important issue of the year…It is historically conservative, rural, Republican Longmont—not its liberal brother Boulder this time—that the county, state and even nation has to thank for its leadership on this important environmental issue.” Indeed! Learn a little bit more about the Grail and Grailville! Recently, Grailville, a center of the Grail in the United States hosted an open house! They also sat down for the “Around Miami Township” series to discuss the Grail and Grailville. Follow this link to listen to Grail members Becky Hill and Nina Naberhaus discuss the Grail and Grailville! Interview with Becky Hill and Nina Naberhaus *When you click on the link you’ll be taken to the Miami Township website. Scroll down to the third interview and click on the orange link where you see Becky and Nina’s name. This will take you directly to their part of the interview! In response to the recent directive from the Vatican’s Congregation for the Doctrine of the Faith to the Leadership Conference of Women Religious, The Grail in the United States is Taking A Stand in support for the LCWR. Our letter to the Leadership Conference of Women Religious is below.